Why is it that AdWords always gets the best data and reporting? I know the answer is because advertisers are Google's primary source of revenue, but still. The rest of us shouldn't be left in the dark when it comes to reporting. Over 90% of clicks on Google go to organic or local listings and we've lost access to referring keywords and can't see click-to-call data - which is the best measure of ROI short of actual visits. 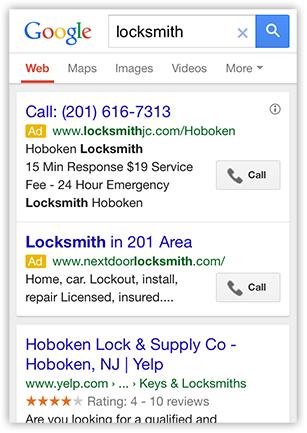 For those unaware, a few years back, Google introduced the "click-to-call" AdWords extension. With this extension a "call" button was added next to ads that allowed mobile users to call a business with one click. A "call" costs the same amount as a standard AdWords click. Click-to-call works especially well in the locksmith industry. Just imagine, if you were to search for a locksmith from a mobile phone, are you more likely to call them up or leisurely sit back and read about their services? 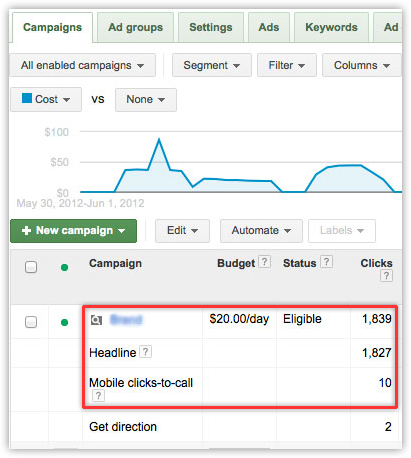 When you sign up for click-to-call in AdWords you're given detailed reports on your calls. As you can see in this AdWords click-to-call report, you can see that out of 1,839 actions, 10 of those were phone calls. This is great data that lets you allocate your advertising spend appropriate and calculate ROI. Over 90% of searchers click on organic listings but all organic click-to-call data is withheld. On Google+ Local we have access to: impressions, website clicks, more info clicks and driving direction clicks. The simple addition of calls would make local search and Google+ Local optimization a no-brainer but until then we'll be left with lots and lots of local businesses wondering what the ROI of their SEO campaigns are. What are you waiting for Google? If you need help managing your Google+ Local page or local online presence, contact us for help! The post Come On Google! Give Us Our Local Click-To-Call Data! appeared first on LocalVox.